So Goddess Interrupted had definitely left my heart in a bind at the end, so I was excited to read this book. Although I felt like it was bittersweet, Aimee Carter has creatively incorporated Greek mythology into her books. I find myself not being able to read a Greek myth without thinking about the characters in The Goddess Test series. They have been implanted in my mind and they are now what I picture even when I read other books. I have really enjoyed reading this series and it’s one that I would probably continue to read if there were more added. There are so many areas that could still be explored with Henry and Kate and some of the other characters. One of my absolute favorite things about this series and I think if I have said before is that these characters stay true to their natures. You are not going to see a bad guy suddenly have a heart of gold. These characters are who they are and their actions fit their nature. I see this in Cronus. He wants Kate to be his queen and companion but don’t let yourself think that his desire for him has made him soft. Cronus is still Cronus and it would only take any kind of betrayal from Kate to make him turn on her. He doesn’t LOVE her he WANTS her and there is a huge difference in that. Kate is such a different character in this book, motherhood has truly matured her and there is no more of the whining that I started to get annoyed by in book 2. She is strong and clever and is finding herself as Queen of the Underworld and mother to her child. There was so much heartbreak and so many struggles for her in this book. These books are very character based and so many different ones have important roles. We learn more about Aphrodite and her betrayal. 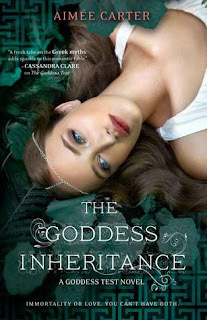 If you haven’t already read the Goddess Legacy it gives us a chance to see her in a little different light. Henry is as always probably the strongest of the Gods, yet he is the least combative. He is the game changer for the battle and we see his importance but also his love for Kate and the baby. There are so many interesting twists and turns that really affect Henry so we get to see the usually emotionally guarded God, react. I’m pretty sure there is nothing that Calliope could ever do that would not make me want to punch her face. I can just not find any empathy for her character. Also if you were afraid that you would miss Persephone don’t fret, she makes a fiery reappearance. We also get to see Henry’s former wife competitors again. I felt like it was a nice touch for the end of the series. This book wrapped up the series well. As someone who has kids of my own there were definite moments that pulled at my heart strings with the baby. I think this book really made the characters shine and show who they really are. If you are fan of mythology I would definitely recommend this series to you. I read the first book in the series but also got annoyed with her whining in book two so I stopped reading it. Maybe I will give it another shot now. Thanks for sharing!